The Tampa Bay Buccaneers are a mediocre, waterlogged 2-3 team and the biggest story of their season is the fragile psyche of their kicker, who they traded up to draft in the second round. Roberto Aguayo was the most accurate kicker in college football history, but he struggled throughout the preseason and his troubles followed him into the regular season. Tonight was no exception. 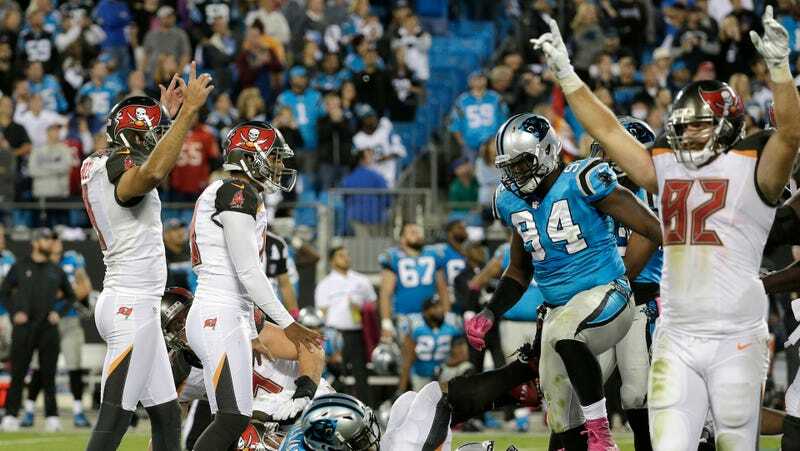 Against the Panthers, he went 3-for-5, missing field goals of 33 and 46 yards. The Bucs managed to get back into field goal range with the clock running out, and Aguayo had a chance to redeem his fuckups. He nailed the 38-yarder to win, then got mobbed by his relieved teammates. Aguayo is now 4-for-8 for the year. Perhaps he’ll end the year above .500.